Leopold's Ice Cream / Scrapbook / From our team / Leopold’s Ice Cream, in Partnership with Live Oak Public Libraries, Announces the 7th Annual Creative Writing Challenge! 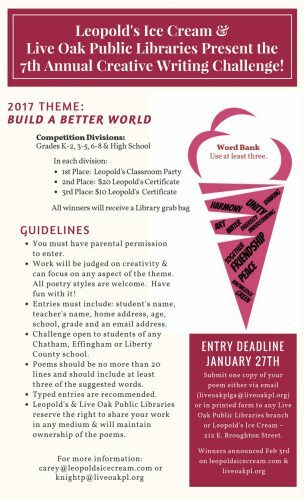 Leopold’s Ice Cream, in Partnership with Live Oak Public Libraries, Announces the 7th Annual Creative Writing Challenge! One finalist from each of the four age groups (K-2, 3-5, 6-8 & High School) will win a Leopold’s Ice Cream party for their classroom! The contest opens today, January 9th, and runs through Friday, January 27th when all poetry is due via email (liveoakplga@liveoakpl.org ) or physical submission at a Live Oak Public Libraries branch or Leopold’s Ice Cream. Winners will be announced on or about February 3rd on the sponsors’ websites. Stratton & Mary Leopold, longtime advocates of literacy and fostering creative energy in our youth, have hosted the annual competition since 2011. The contest has proven to be a huge success with hundreds of entries each year. Click image on the left for full contest rules and informational flyer. 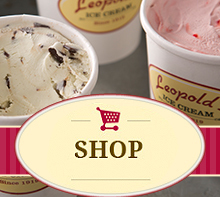 « WINNERS ANNOUNCED IN THE SEVENTH ANNUAL LEOPOLD’S ICE CREAM CREATIVE WRITING CHALLENGE!